It’s amazing how many points there are on the educational philosophy spectrum. On one hand, you have the ultra-standardized-testing approach, and on the other hand you have something as radically different as the Sudbury school approach. My bias is clear: I see this spectrum in a sort of vertical fashion. In other words, the more a school looks like a Sudbury school, the better. Another Trillium parent alerted me to a recent New York Times op-ed piece by Susan Engel, entitled “Playing to Learn.” It contains a lot of good insights. If I cherry-pick a bit, I can make it sound like she’s arguing for the Sudbury model. And in some ways, she is (even if she doesn’t realize it). [E]ducators should remember a basic precept of modern developmental science: developmental precursors don’t always resemble the skill to which they are leading. For example, saying the alphabet does not particularly help children learn to read. But having extended and complex conversations during toddlerhood does. And conversation is one of the main things that happens in a Sudbury school. Why? Because that’s what people do, it’s what they thrive on and learn from and grow from. So it sounds like Engel could be arguing for the Sudbury approach. What they [students] shouldn’t do is spend tedious hours learning isolated mathematical formulas or memorizing sheets of science facts that are unlikely to matter much in the long run. Scientists know that children learn best by putting experiences together in new ways. They construct knowledge; they don’t swallow it. This will resonate with a lot of people who are looking beyond traditional education. People (including kids) learn through experiences that matter to them. Knowledge is best retained when it’s relevant and has some practical application or at least some inherent meaning for the student. To demonstrate this, all you have to do is ponder this question: How much do you remember from your least favorite subjects in high school? Research has shown unequivocally that children learn best when they are interested in the material or activity they are learning. Play — from building contraptions to enacting stories to inventing games — can allow children to satisfy their curiosity about the things that interest them in their own way. It can also help them acquire higher-order thinking skills, like generating testable hypotheses, imagining situations from someone else’s perspective and thinking of alternate solutions. Once again, play is huge at Sudbury schools. Why? Because play is huge for children. 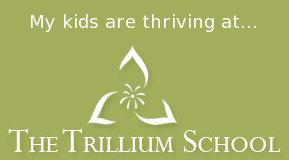 It’s amazing to witness, on those days that I’ve volunteered at The Trillium School, the complex, drawn-out games and types of play that kids will invent when they’re given a chance. They’re constantly figuring out the world around them, in concert and camaraderie with their friends. There’s no stopping them. To me, and to Sudbury proponents everywhere, these insights clearly support the Sudbury approach to education. In a nutshell, kids are great at learning. They want to learn, and will learn. They’ll pursue what they’re interested in, which—convenience of all conveniences—turns out to be exactly what they’ll be best at learning too. Among the most important things Sudbury students learn is self-efficacy, a knowledge that they can learn, which serves them well in just about anything they choose to pursue later on, whether it be in college or not. In this classroom, children would spend two hours each day hearing stories read aloud, reading aloud themselves, telling stories to one another and reading on their own. After all, the first step to literacy is simply being immersed, through conversation and storytelling, in a reading environment; the second is to read a lot and often. A school day where every child is given ample opportunities to read and discuss books would give teachers more time to help those students who need more instruction in order to become good readers. • Principle: Each person’s education is their own responsibility. • Methodology: Teacher-directed learning only ever happens at a student’s specific request. • Principle: Children learn best in interaction with people of all different ages. • Principle: People are different and shouldn’t be expected to learn the same things, or at the same time. • Methodology: There is no required curriculum in a Sudbury school. I heartily welcome Engel’s op-ed. It’s great to see more awareness of and attention paid to the fundamental problems of traditional schooling. Her prescriptions ultimately don’t go far enough; the logical consequences of her insights, and of the science that she alludes to, ultimately point to something that looks more like a Sudbury school. But it’s definitely a start.